FanFooty is launching an advanced fantasy service called FanFooty Premium. The main launch feature is a live news service called Insights which already includes over 1,000 individual player snippets from 2015, which are all archived and searchable by icon, keyword, club or fantasy status. You might be familiar with this sort of service from other providers in the AFL, but Insights has double the amount of news items so far in 2015, and covers a far greater range of players, not just the popular ones. Premium users will also enjoy an enhanced matchday experience with an ad-free matchcentre page which has no five-minute refresh, plus a coloured name in chat. Not just purple… you’ll be able to choose your own colour! Team icons will remain a special occasion for everyone in the second half of the last game of each round. Early Premium users will be able to lock in the low launch price of $9.95 (annual) as further features are added in subsequent updates. 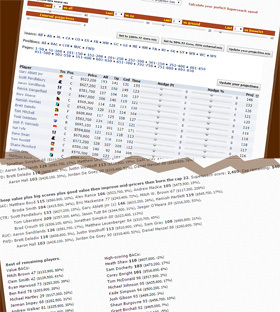 While the initial launch of Premium is mostly about the journalistic content in Insights, which is similar to Rotoworld or Rotowire for American fantasy sports, further updates will be mostly focused on tools for deeper analysis, particularly for use in the increasingly popular draft league formats, like cheat sheets and customisable draft kits which can be exported to any draft league. Please note: click on the link to come back to the site once you’ve made your payment so that your account can be automatically updated to reflect your new membership status, and you get access to the new content. The Premium status attaches to your login on the main site, NOT your forums login – this is the login that your see in the black bar at the top of each page. It would be advantageous if you were logged in before you bought the product to make the process seamless – otherwise you will have to wait for me (m0nty) to update your account manually. You will be brought back to this page if you try to access Premium content without being logged in to an account with the Premium membership. I signed up for the premium content last night but hadn’t logged in when I did it. Just seeing if you can update my account. Hey monty, like Mark posted the other day I think I’ve done the same thing. Signed up for premium but wasn’t logged in. Can you check please? G’day Monty, signed up and paid and the screen showed a series of numbers. How do I know if it was successful? Hi Monty, same problem as Tim with premium account error message. Can you activate manually please? Hey mate. Have paid for premium but I cannot activate account. I never receive an email. Hey m0nty, same problem as Tim. Any help would be great. Is anyone else having any luck getting premium activated? Come on Monty – please. swomber23@gmail.com Thanks. Do you need premium to access sc bubble boys and roller coaster? All of these issues have been resolved, Marvin. They just don’t come back to this thread and thank me afterwards. But that’s okay! Signed up under Andrew37 but no premium yet. Thanks. Can provide rpt. Signed up under rossdodd but no premium as yet. Hi. I paid for the premium upgrade and was working fine last night but now it wont let me in the premium section again? I upgraded to premium, but I did not have an account when I did so.. I upgraded to premium before I made an account. Could you please update this? I have upgraded to premium but dont yet have mobile access, can you update this please. I have upgraded my account to premium access, but I can’t access the mobile site. It says that I have no premium access. Hi – signed up to premium mid May. I am still seeing ad banners in live match day, and don’t seem to be getting premium on mobile. Can you please check if my account was updated? paid for premium, please activate – also projections tools not working – assume this is dependent on premium being activated??? Just paid for premium, but it doesn’t seem to have linked to my account. Could you please link it? Hey m0nty, Purchased premium – could you pleas update my account? Upgraded to premium today, and while I can get on to the mobile site and use lots of the tools, I can’t see the insights on player pages. Is this something you can fix? I wonder what menangola and Thurlow did not to get picked ?? I tried to email you using the supplied address m0nty@fanfooty.com.au. but the email was undeliverable. Is that address right? I paid for the premium content last night but hadn’t logged in when I did it. Just seeing if you can update my account. I paid for the premium content last week, but noiticed it hasnt been reflected in my account. Can this be updated soon? Actually its working now Apologies, had some login issues before. However, one thing to check is maybe an email confirmation – I haven’t got one despite leaving my email address. I have registered using ”bringiton” but have not received confirmation email.